*Parking Ticket fines can be paid in the Cashier’s Office located on the first floor of Tazewell Hall. Download the SWCC Bus Schedule – Visit the Four County Transit website at www.fourcountytransit.org for the most current schedules and more information. Buses are provided by Four County Transit and will arrive by 7:45 a.m. and depart SWCC at 4:30 p.m. from the turnaround in front of Dellinger and Tazewell Halls. Before departure, students are asked to wait in the Ratliff commons area where they can stay warm and still visibly see the bus. All bus stops and times subject to change; however, all changes will be posted on Four County Transit’s web site www.fourcountytransit.org. Please allow ten (10) minutes before and after each stop. All questions regarding the buses should be directed to Four County Transit at 276.963.1486 or 1.888.656.2272. 1. Current decals must be displayed on your vehicle when parking in any student parking lot. 2. Special Parking Permits for short term use may be obtained from the Campus Police office. This permit will allow you access to the student parking areas at the top of the hill. Request for this permit must be accompanied by a physician’s statement regarding the nature and extent of your disability. 3. Lost or stolen decals will be replaced upon request to the Admissions Office. 4. Students who drive a vehicle that is not registered and does not bear a proper decal must obtain a temporary one from the Campus Police office located in the Physical Plant building. 5. Staff parking decals will not be issued to students, work-study students, or other student workers. 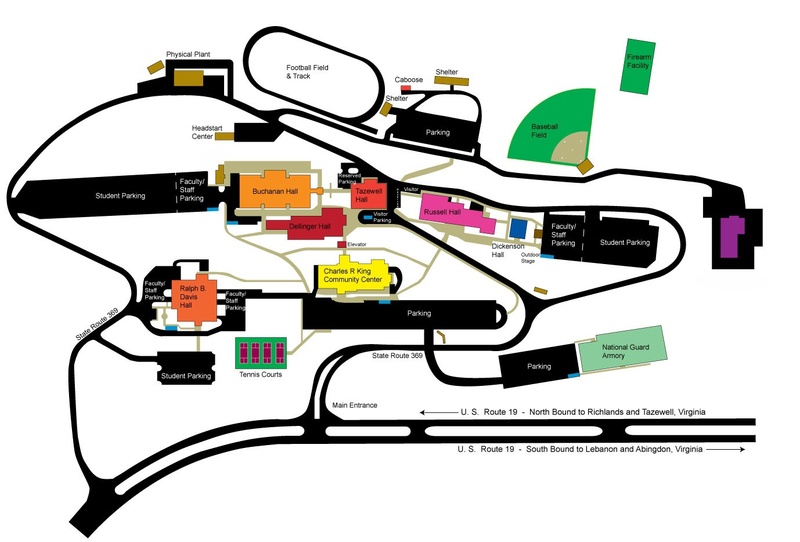 Refer to the Campus Map to find the location of classrooms and student parking lots. Student parking in areas as indicated. Lot 1 – Off main entrance at Marquee- student parking throughout. 1. Vehicles must display decals. 1. Parking in any undesignated area, including occupying more than one designated space. 2. Parking in Handicapped Parking Spaces without a state issued Handicapped Parking Permit. 3. Parking in any area designated Visitor, Reserved, Assigned, or Restricted without proper authorization. 1. Any vehicle found to be in violation of regulations is subject to a fine. If not paid with in ten working days the fine will double. If not paid in 25 days the matter will be resolved by the appropriate Dean or turned over to the Business Office for proper collection. 2. If you feel that you have received a ticket in error, it is your responsibility to contact the Campus Police office as soon as possible (bring the ticket with you) so the matter can be resolved. 3. Repeat offenses may result in campus parking privileges being suspended or disciplinary action.